The ashes we use are the burnt palms from last year’s celebration of Passion Sunday. We begin our Lenten journey aware of where we are going. We want to enter into the passion, death and resurrection of Jesus for us more fully. That is the purpose of our journey. It is why we mark our heads with his cross. It is why we fast today and abstain from meat. Our Lenten program is not an effort to save ourselves. We have been saved by Jesus’ sacrifice. Our self-denial helps us, in the darkness that surrounds us, to prepare ourselves to receive his light. For this is a journey to the Easter font, where we will renew the promises of our baptism, remembering that in dying with him in the waters of baptism, we are re-born with him to everlasting life. This year’s journey begins today. Yet even now, says the Lord, return to me with your whole heart, with fasting, and weeping and mourning. 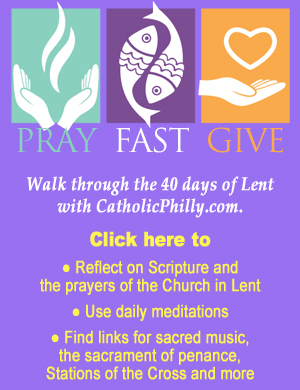 Lord, help us to resist temptation by our Lenten works of charity and penance. By this sacrifice may we be prepared to celebrate the death and resurrection of Christ our Savior and be cleansed from sin and renewed in spirit. We ask this through Christ Our Lord. Today God our Father brings us to the beginning of Lent. We pray that in this time of salvation he will fill us with the Holy Spirit, purify our hearts, and strengthen us in love. Let us humbly ask him: Lord, give us your Holy Spirit. May we be filled and satisfied, – by the word which you give us. Teach us to be loving not only in great and exceptional moments, – but above all in the ordinary events of daily life. May we abstain from what we do not really need, – and help our brothers and sisters in distress. May we bear the wounds of your Son in our bodies, – for through his body he gave us life. Lord, it feels like we are embarking on a Lenten journey together, you and I. The beautiful words in the today’s prayer talk about the “quiet remembrance of our need for redemption.” That feels like what I am looking for or what you are looking for in me. I want to remember how much I need you in my life and how much my life needs redemption. I want to remember it clearly and in the background of my day today and all through Lent. On this special day, Ash Wednesday, may my small sacrifices in fasting be a way to clear away the clutter in my life to see you more clearly. 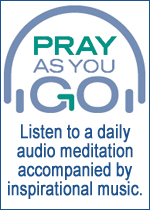 May my longing for meat and other food, help me to focus my life today more outside myself. Let me be aware of those who are in so much more suffering than I am and may I be aware of them as the brothers and sisters you have placed in my life. Lord, I know there is darkness within me and around me. Bless these days with your Word. Let your Light shine in the darkness. Help me long for that Light until we celebrate it at the Vigil six weeks from now. And most of all Lord, help me to honor this day with the ashes on my forehead. They help me remember where I have come from and where I am going. May I acknowledge to you my sins and my deep need for your loving forgiveness and grace. I pray that this Lenten season will make me so much more aware of how much I need your healing in my life.